We recently spent some time in the state of Maine. We chose late fall for our trip knowing that the tourist season would be over and we could have all the wonderful lobster dinners to ourselves. The irregular coastline of Maine with it's many back bays sometimes looks more a land of lakes than a ocean shoreline. One place that I like to photograph is at Pemaquid Point. This is the location of the Pemaquid lighthouse that sits on the rugged rock shoreline. 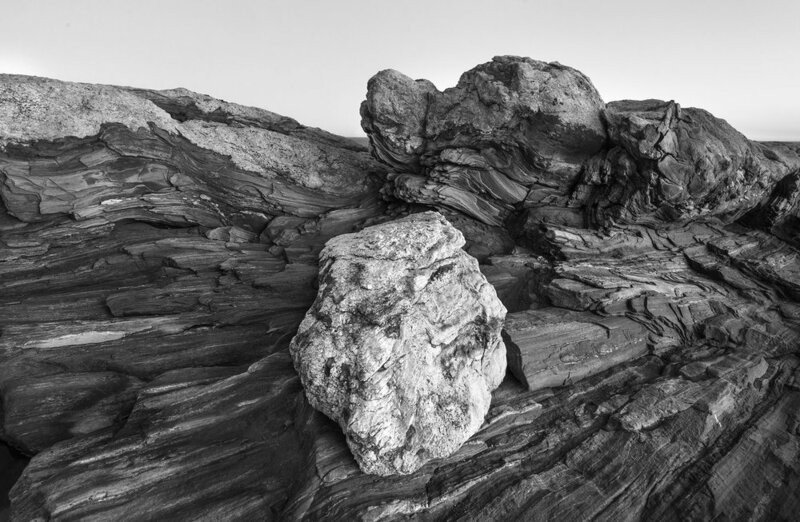 I am fascinated with the shapes and contours of the rocky coast in this area. I made this image long after sunset with very little available light left for photography. I often prefer this soft light to bring out the details that would normally be lost in the bright sunshine. The reflective light from the open sky makes the white boulder glow against the darker surrounding rock. I was honored to have this image win an award in the Nature & Wildlife Art Exhibition held at St. Augistine Arts Association Gallery. I made this image in May of this year at Manatee Spring. Florida. I enjoy photographing from a kayak because I am able to get back in area that otherwise would be difficult to access. I live near Blue Cypress Lake in Florida. It is a wonderful wilderness area that has plenty of wildlife. I enjoy kayaking along the shore of the lake where there are numerous tall cypress trees that stand in the water. My little kayak is equipped with an electric trolling motor to reduce the amount of paddling I need to do when I am out photographing. My camera of choice for this type of photography is the Sony A7R11 because of the five axis in camera stabilization system the camera has. I like to use a Zeiss Batis 18mm or Sony 16~35mm zoom lens when I am out on the water. Both lenses are ideal for these kind of images because it lets me include a lot of sky and water in the image. I am always fascinated with these majestic trees that stand alone surrounded by water. I made this image of a waterfall in Iceland in the month of May. The daylight hours are nearly twenty four hours a day at that time of year. This image was made after 10:30 p.m. and there was plenty of daylight to keep photographing well beyond that time of day. It is easy to forget the the late hour and push yourself well beyond your limits to keep traveling and exploring new areas to photograph. The light in Iceland is constantly changing and creates the opportunity for some dramatic images. I hope to return to this wonderful land and continue to find new and interesting landscapes to photograph. I made this image near the town of Hofn while I was in Iceland. The weather is constantly changing in this artic land and something you will need to wait for the right conditions to make a desired image. I waited at least an hour or more for the clouds to clear the mountain peaks in this scene. As I waited I dealt with some rain as well as wind. It is easy to give up on a location when the weather doesn't co-operate and when travel is involved. Often I quote Edward Weston's belief that, " while you are waiting for it here, you are missing it there". But on this particular day I am glad I hung around for the storm clouds to clear and make the image. I recently made a trip to Utah and came away with a few new images to work on. As I review my images in Lightroom, I realize how much I appreciate the days I worked with film and the darkroom process. Working primarily as a black and white photographer, it requires me to pre visualize, as best as I can, the scene as the finished print while in the field. When working with Black and White film the process is made easier because the only time I have to deal with color is at the time of exposure. With the digital process there is a disconnect of what I visualized in the field and what is viewed on my computer screen, because of the RAW image being in color. It can be a bit more challenging to bring out the initial emotional response I had to the subject in the finished print. It has been my experience that the film/darkroom process is easier at the start and gets more difficult working towards the finished print. The digital process works in the opposite direction by being more difficult starting with a fuzzy. faded, RAW file that is in color, and then gets easier by utilizing the accurate controls offered by photo software. For me personally, I try to maintain my thought processed I used with Black and White film and apply as much of it as I can to my digital imaging work flow to achive my desired final image. As photography progresses we will be faced with new equipment and ways we deal with our images. During these changes we tend to get focused on how we photograph and the equipment we use, rather than the reason why we are inspired to photograph and create.